Whoever thought of wearing a dress as a top is a fashion genius - talk about maximizing your wardrobe, right? Although, I didn't invent the idea, I certainly enjoy every bit of it =) I am participating in Tara's what I wore to work link up today. Have a great Thursday, everyone! LOVE the dress as a top. The skirt looks perfect with it. You look beautiful! I agree that the dress as a top or dress as a skirt is the best idea! This dress is so pretty and works perfectly as as a top. im sooo lovin the aztec dress! This is the most stunning dress ever. I love it. 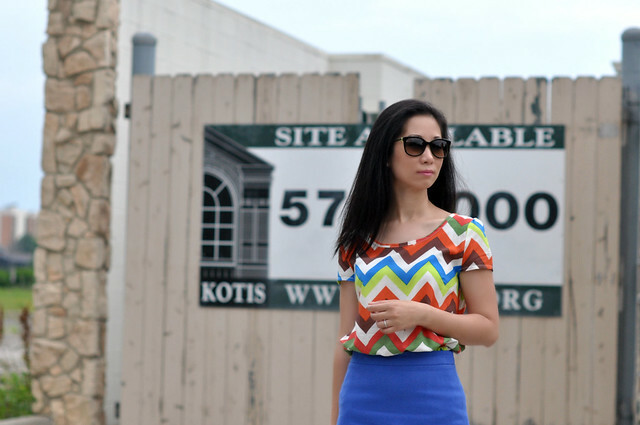 I just adore chevron and bright colours. This dress looks great as a top and incredible with the bright blue. such a great idea!! :) love this whole look! The blues match so perfectly! Great remix! Very pretty. I can't tell there's a dress under the skirt. I know amazing idea right?!? As long as it can be tucked in without bulk it's so great! Love this pairing Sydney! ahhh! probably one of my favorite outfits of yours! the chevron is so pretty against the sold blue!! love it! you look gorgeous sydney! I love that dress as a top and with the blue skirt! You look great btw Sydney, cant believe you lost all your baby weight so fast!!!!!! 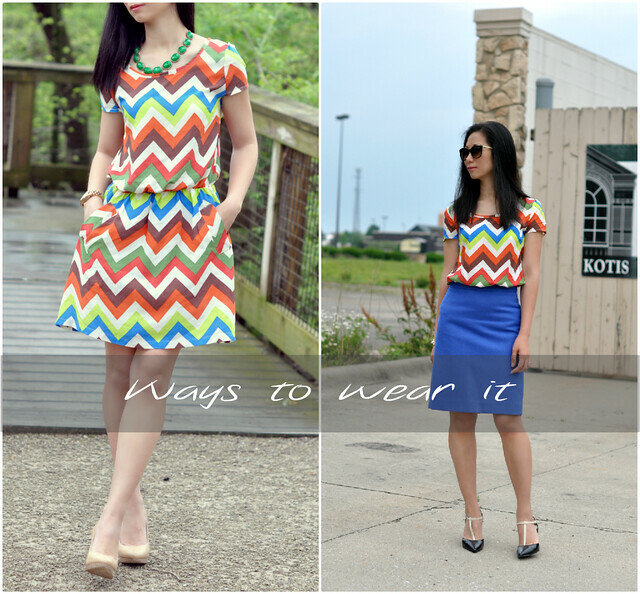 Totally in love with the chevron print! Yes, such a great idea, though I haven't tried it out yet. I actually love it as a top more than the dress! Great outfit! What a great idea. You never would know that it is a dress.